This apron consists of a flat bolt and a 3-point hook, it can be fitted to all machines (Telescopic and Loaders) and allows the take-up of any equipment with an attachment 3 points. The 3-point hook is adjustable in width to fit the dimensions of different agricultural equipment. 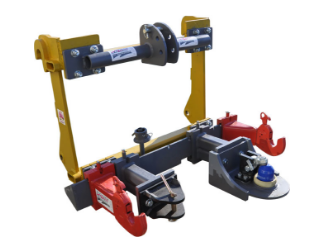 It has a storage piton for the ball joints of the 3-point hitch and is equipped with a device suitable for maneuvering the trailers.